Dimensions: 8 1/2" x 13 1/2" x 17 3/4"
Dimensions: 8 3/4" x 13 1/2" x 21"
Dimensions: 14 3/4" x 19 3/4" x 34 1/4"
Destroyit 2604CC is a perfect Cross Cut centralized office paper shredder. Dimensions: 18 1/2" x 19 1/2" x 36 1/2"
Destroyit 3104CC is designed for medium size offices. Destroyit 3105CC is designed for shredding confidential documents. The Destroyit 3803CC Shredder is a great choice for office use. The Destroyit 3804CC Cross Cut Shredder is a great choice for office use. Destroyit 4002CC is competitively priced for medium size offices. Destroyit 4005CC is a departmental Shredder for shredding confidential documents. Dimensions: 39 3/4" x 25 1/4" x 23 1/4"
Destroyit 4107CC cross cut is an industrial shredder for shredding confidential documents. Destroyit 4605 cross cut industrial shredder for shredding confidential documents. 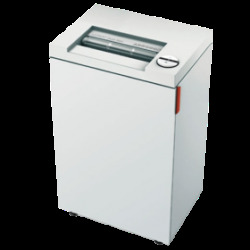 Cut Size: 3/16" x 2 3/8" or 3/32" x 5/8"
Destroyit 5009 cross cut industrial shredder for shredding confidential documents. Cut Size: 11/32" x 1 1/2" -3"
Dimensions: 11.5" x 15.5" x 25"